Discussion in 'Jacket Art / Patches - Original and Reproduction' started by dinomartino1, Jan 14, 2019. The 135th Assault Helicopter Company was activated at Fort Hood, Texas on 1 February 1967. In October 1967 the unit deployed to Vung Tau, The Republic of Vietnam. At the time of deployment the Australian Government dispatched a Navy Helicopter flight to Vietnam . The Australian flight was assigned to the 135th, and the unit became known as an "Experimental Military Unit", or EMU for short. The 135th AHC consisted of two troop carrying flights and a gunship flight known as the 'Taipans'. working in III and IV Corps. To facilitate operations the 135th moved to Blackhorse in December 1967 and then to Bear Cat in November 1968. On 8 September 1970, the EMU's moved again,this time to Dong Tam, supporting Vietnamese Army units in the Delta. As other Aviation units in the Delta deactivated, the onlyUS/Australian helicopter unit in existence took up the slack. The 135th daily flew great distances from home station insupport of the war effort. As the only completely integrated Multi-national Helicopter Company fighting in Viet Nam the EMU's developed pride and dedication to their motto,"GET THE BLOODY JOB DONE". In 1971, the EMU's moved to Di An. In June 1971, the Royal Australian Navy portion of the 135th deactivated and was replaced by US personnel. US Flyers hot weather shirt : Naval Air Mechanic (Weapons) A J R Curran, Royal Australian Navy Helicopter Flight Vietnam. Sewn to the right pocket is the cloth badge of the 135 Assault Helicopter Company 'Taipan' gunship flight. Black scarf with Taipan badge : Naval Air Mechanic (Weapons) A J R Curran, Royal Australian Helicopter Flight Vietnam. During his first operational deployment he served as a Naval Air Mechanic in Korean waters from 27 October 1953 until 2 June 1954 as a member of 805 Squadron serving aboard the carrier HMAS Sydney. He was awarded a United States Air Medal for his actions in assisting in the rescue of a downed helicopter crew during an operation in the U Minh Forest, An Xuyen Province. The crew of the helicopter were surrounded by Viet Cong forces and the pilot of Curran's helicopter flew to assist. Upon arrival over the area, Curran provided accurate suppressing fire, which allowed the downed crew to be rescued by another nearby helicopter. Pictured are MAJ Harry T. Woodmansee (EMU 6) & CPT Walker Knight (EMU 26) US army in 1969. The 135th AHC was the only aviation company in Vietnam authorised to wear navy blue berets that was a part of the RAN uniform. A UH-1N helicopter that was flown by RAN EMU Flight Vietnam in 1968 on display at the RAN fleet air arm museum. dujardin, unclegrumpy, B-Man2 and 1 other person like this. dujardin and dinomartino1 like this. The scarf in the first post peaked my interest, because I wanted to see if I could find a photo of someone in the unit wearing one. In the course of that search the patch below popped up. Given the extensive discussion in another thread regarding an unknown post WW II era kangaroo patch, I thought some of you might enjoy this....my apologies for it's political incorrectness...I hope those with certain sensitivities close their eyes and look no further. "This patch was sent to us by Ben “Gentle Ben” Thompson, Kennel Keeper 3, 240th Assault Helicopter Company, 1968-1969. The patch was made sometime in November of 1968, and it has “Seasons Greetings” on the upper left side and “Things To Do Today” on the bottom right. 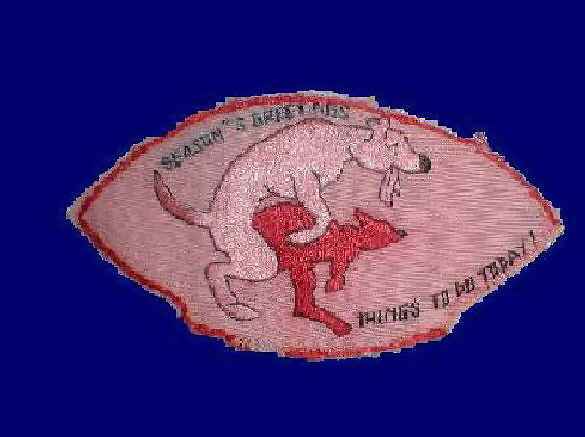 The patch shows the logo for the 240th AHC SLICKS, the Greyhound, “WRESTLING” with a kangaroo, which represents the outstanding 135thAHC, our neighbors next door at Bearcat, South Vietnam. The kangaroo was chosen because the 135th AHC was comprised of United States Army personnel and from our trusted and valiant allies, the Australians; in this case the Australian Navy. The patch was made into a 2’ by 4’ flag that was flown at the 240th BOQ during happy hour and parties. The Australian Club was nearby and they tried to steal this flag numerous times when it flew. “Gentle Ben” was told after he left South Vietnam, the Australians eventually captured the flag and burned it. Nothing like a little inter-service aviation and allied rivalry to lighten and brighten a day during your tour in South Vietnam." dujardin, dinomartino1 and falcon_ib like this. The yanks sure took to the RAN beret, wonder if they where jealous of the RAN guys being allowed beards. Made me curious as I never see US sailors sporting beards so I looked up the USN policy and they banned them in 1984. Sailors can get permission to grow a beard for religious reasons or if they have a skin condition that's irritated by shaving. Moustaches are allowed as long as they are trimmed and neat. "Handlebar mustaches, goatees, beards or eccentricities are not permitted,"
Lieutenant Robert George Ray, 2nd Contingent, RAN Helicopter Flight Vietnam (RANHFV), Observer and Operations Officer with the 135th Commanding Battalion. RANHFV is serving with the 135th Assault Helicopter Company (135th AHC), United States Army. !069 Lieutenant Ian Maxwell (Max) Speedy, Pilot, 2nd Contingent, RAN Helicopter Flight Vietnam (RANHFV), at Tan Son Nhut Air Base, prior to embarking on a flight to Australia at the end of his tour of duty. RANHFV is serving with the 135th Assault Helicopter Company (135th AHC), United States Army. He was allowed to keep the purple heart medal, the official awarding of it was canceled.